Muso Jikiden Eishin-Ryu Iaijutsu is the Japanese martial art of swordsmanship which emphasizes drawing and cutting with the samurai sword (called a ‘katana’) in a single fluid motion. Muso Jikiden Eishin-ryu is a ‘koryu bujutsu’ (which means ‘traditional martial art’) with a direct lineage back over 450 years to its founder, Hayashizaki Jinsuke Shigenobu, who developed this particular style of swordsmanship. The current and 20th headmaster of our branch of Iaido is Miura Takeyuki Hidefusa, Hanshi, Jyudan (10th dan black belt) and founder of the Nippon Kobudo Jikishin-kai (Japanese Ancient Weapons True Spirit Association). The Jikishin-kai USA & International continues the tradition of Muso Jikiden Eishin-ryu iai-jutsu outside of Japan under the instruction of Masayuki Shimabukuro, Hanshi, hachidan (8th dan black belt). Shimabukuro Sensei is a direct student of Miura Sensei and has studied Iaido (Iaijutsu) for over 30 years. 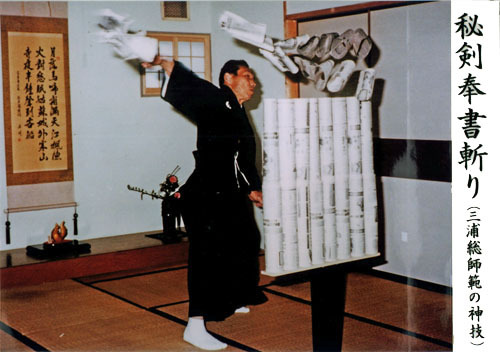 The Jikishin-kai honbu dojo emphasizes traditional practice and application of the techniques in the Muso Jikiden Eishin-ryu curriculum. 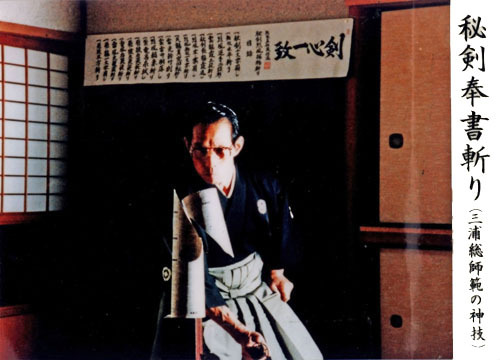 This curriculum encompasses the practice of waza(solo techniques of which there are over 40), katachi (paired patterns using a wood sword or ‘bokken’), and also tameshigiri (test cutting using a live/sharp sword on rolled mats). These three components serve to reinforce and improve the other to make the student of iai-jutsu aware of proper body mechanics, focus, and technique for the effective use of the sword. All three of these, plus the integral observance and practice of sincere etiquette make up the core curriculum at Sakura Budokan. Iaido requires extreme precision of its techniques and demands tremendous concentration during practice-both of which ask a great deal of self-discipline and sincere personal commitment on the part of the student in order to master. As a reward for these efforts, it can offer the individual a lifetime of physical, mental, and spiritual growth, as well as an enlightened and peaceful state of mind.